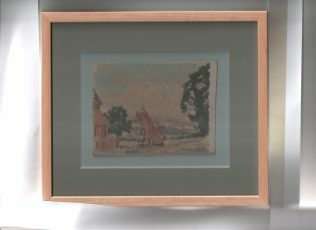 I have a tiny watercolour sketch, painted and signed by Harvey Adams. It appears to be a early farm trailer, or wheat collector. This sketch is on a small card of handmade paper and it is just as if the artist was making a visual note for himself; as we might today take a photograph. If anyone know more about the picture, or the farm machine, or the location, I would love to learn more. We have had am exchange of information about this sketch, and the signature appears to be HERVEY ADAMS, rather than Harvey, which points to the recorded artist by the name of Hervey Adams. Thank you for this imformation, I’ll give ‘hay loader’ a try in Google. It is a little difficult to tell and I am not an expert but the machinery looks like a hay loader. This would be pulled behind the hay wagon and lift the hay for the farm workers to spread across the wagon bed with their pitchforks. It is quite high, which is why I think this is what it is, as this would enable the load on the wagon to be maximised. As with all things which increase efficiency I expect it was a great improvement from having to manually use a pitchfork to throw the hay from ground level but almost certainly required fewer men to gather the hay!